The first mother is our biological mother, from whose womb we have come to this world. Then there is the wife of the teacher or spiritual master; the wife of a priest; the wife of the king, or the queen; the cow; the nurse or caregiver; and, finally, the earth, often referred to as “Mother Nature.” In Sanskrit, the country in which we take birth is called desa matrika or “motherland.” We refer to our language as “mother tongue.” So you can see that there are so many mothers, including the cow, in the Hindu tradition, because of her selfless service to provide milk. In India, a cow is sometimes addressed as amba, which also means mother. There is one common principle that characterizes all genuine mothers, and that is selfless, loving service to their dependents. This pure loving intention is the true life- giving force that our mothers nurture us with. Whether it is milk from her breast or the fruit of a tree, a mother’s offering is pure. No matter how hard modern science tries to emulate the pure offering of a mother, it will never succeed. The failed history of baby formula is a case in point. In a recent report by the Environmental Working Group (EWG), tests performed on liquid baby formulas found that they all contained bisphenol A (BPA). All major baby formula manufacturers use this leaching, hormone-mimicking chemical in the linings of the metal cans in which baby formula is sold. BPA has been found to cause hyperactivity, reproductive abnormalities and pediatric brain cancer in lab animals. Increasingly, scientists suspect that BPA might be linked to several medical problems in humans, including breast and testicular cancer. Despite technological advances in food production, including cloning and genetic manipulation of foods, genetic scientists have failed to create a single blade of grass from raw chemicals. Genetic engineering (GE) and genetically modified organisms (GMO) are, in reality, just modifications of what has already been naturally created by Mother Nature. It is absurd to think that we can ever match the brilliance of Mother Nature and create like her. 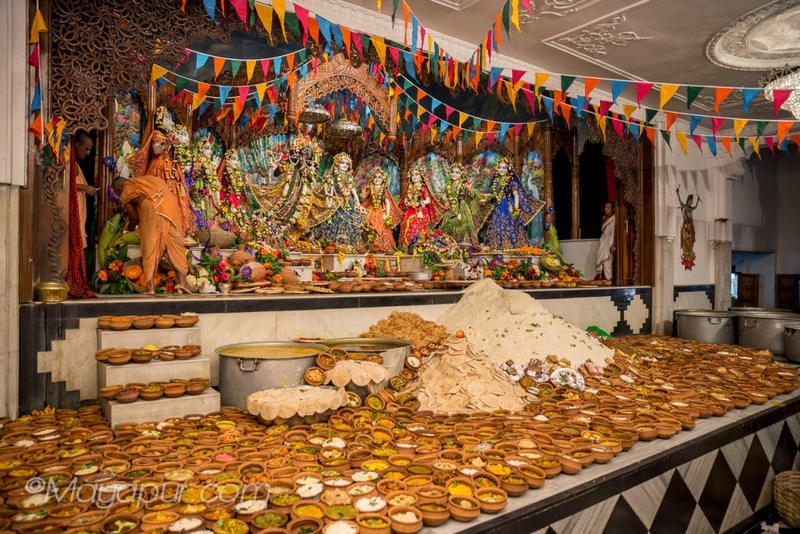 Massive offering of food to Radha and Krishna in Mayapur, India. The beginning of true human evolution comes when we acknowledge this dependence on the Great Creators (the Divine Masculine and the Divine Feminine) and begin to offer our food to them with gratitude and love. Only when we understand our innate connection to our Creators can we begin to experience genuine happiness and contentment, just as a fish does when returned to water, its natural environment. By offering food back to our Source with loving intention, we acknowledge our dependence on a higher power, while expressing our gratitude in a practical way. For example, when a young child offers her parents a “work of art” with sincere love, the parents naturally accept the offering of love with gratitude. No God or Goddess requires our humble offering, but they willaccept the loving energy invested in it with great satisfaction. This symbiotic and dynamic reciprocation of love is what energizes and maintains the entire creation. Paul Rodney Turner is the director of Food for Life Global, the world's largest plant-based food relief. Also known as the "food yogi, Paul is an author of 5 books, a numerologists, poet, billiards instructor, raw food and vegan chef and graphic designer.